SMART INVESTMENT! Hot Towel Cabi That Features a 10 YEAR WARRANTY! Why, hello there! We are so glad you stopped by! Can you please join me, right over here...no, a little more to the right...just step around that box....3 steps to the left....ok THERE! 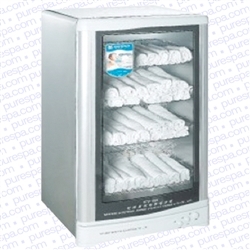 So, I called you here to show you these great new hot towel warmers Pure Spa Direct just added. I hope you are as excited as I am! by Taiji is a SMART investment for any beauty business! Now, I know you are wondering why I was so eager to get you here today to see these hot towel warmers. I know, we all already have great hot towel warmers in our spas and salons. But...oh, what is that? Oh, your hot towel warmer is starting to rust? Mhmm, I see. Oh, oh, your hot towel warmer is rusting as well? Hmmm, now that IS a problem, isn't it? Well, that is EXACTLY why I wanted us to get together to check out these new Taiji Hot Towel Cabis. You see, they feature an unsurpassed 10 YEAR LIMITED WARRANTY against rust and a 2 year electrical warranty! How can you beat that? Keeping warm towels on hand is essential for all spas and salons. There are so many uses for warm towels, but they all achieve one thing: relaxation for your client! 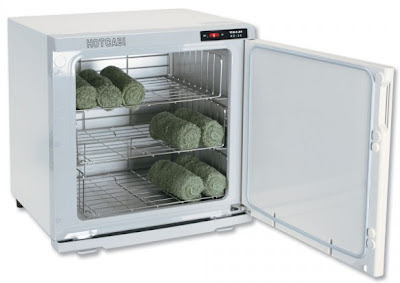 So, whether you are performing spa services and using warm towels to remove product or if you are performing hand, nail, or foot services and incorporating the warm towels into your massage, a reliable hot towel warmer is an essential piece of equipment for your business. Purchasing a Taiji Hot Towel Warmer will give you the peace of mind you need to successfully lead your business, without worrying about your equipment! WOW! I love this unit, and trust me, this picture does not do it justice! This is one of the most attractive Hot Towel Cabinets I have ever seen. The tall and slender design of this unit is stunning, but this beauty is also functional with a whopping 125 towel capacity. No more surprises during treatments - your staff will ALWAYS be able to tell (at a glance) how many towels are available and when it is time to refill! Stainless and light grey design looks clinical and professional in any spa / treatment setting. Quick touch BUTTON controls gives you hot towels on demand!